Happy Third Book Birthday Twenty-Eight and a Half Wishes!!! 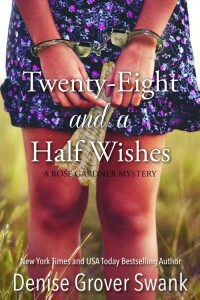 Three years ago today I entered the publishing world when I released the eBook of Twenty-Eight and a Half Wishes on Amazon, B&N and Smashwords. But silly me didn’t officially declare the release for another week–until the print book came out. Anyone who’s known me any length of time knows my story. I hoped to sell 1ooo books by December 31, 2011–six months. But I hit that “magic” mark in September. THAT was when I felt like a “real” author. As of today, I’ve sold over 700,000 books. Add a minimum of 100,000 more if you include all the box sets and collaborations I’ve taken part in. Obviously I don’t. sold the movie option rights to my YA series. If you had shown me these facts three years ago, I never would have believed it was possible as an indie author. Back in 2011, I suspected that I was committing career suicide, but I was stubborn enough to do it anyway. Back then, I still wanted to be traditionally published. Now I’ll consider it if the right deal comes along. (Never say never!) But back then I had a story born from my heart that my beta readers absolutely LOVED. Only no agent or editor really wanted it. Now, I can kind of see why. Twenty-Eight and a Half Wishes is a genre bender. Part romance. Part mystery. Part coming of age. No one wanted to touch it. So how many copies of Twenty-Eight and a Half Wishes have I sold? Only 36,000. But that’s because the eBook has been permafree since October, 2013. The real question is how many books have I given away? Over 800,000 copies. But the real key to the success of the series is how many copies I’ve sold of the second book, Twenty-Nine and a Half Reasons. Within the next day or two, I’ll hit 90,000 sales. When I add up the sales of all five books and the novella, I’ve sold nearly 275,000 books. In three years. To celebrate anniversary of the book that changed my life and as a thank you to my awesome readers, I’m hosting thirty-one days of giveaways–a giveaway every day in July! Some will be a small prizes like eBooks or print books. One of the bigger prizes will be an iPad mini. Be sure to stop by Facebook page every day! And thank you to all my readers! I wouldn’t be where I am without you! Love your books, I put the release dates of your books in my phone with an alarm so I am able to purchase them as soon as they are available. Denise, I have been following you and your story for quite a while. I have been cheering you on all of the way. I am so very happy that you have hit this anniversary and that you are doing so very well. Congratulations to you! Well done! Congratulations Denise! You deserve every bit of your success and then some. Congratulations, Denise! What an amazing accomplishment. I remember sitting down with Heather a couple of years ago and she blew my mind telling me about her boss and what an amazing job she was doing in self publishing. I had just released my first self published book and it gave me so much hope and inspiration for the future. I appreciate how honest and open and generous you are with your readers and with your fellow authors. I’ve learned so much from watching you and I can only hope that someday I’ll be able to say I sold 700,000 books. Happy Book Birthday! Love your books. Happy Anniversary! thanks for taking the leap because it’s been a fantastic adventure with Rose. We love her and you. Happy Anniversary! I love this series and look forward to what Rose will blurt out next. I really enjoy your writing style, but I’m most appreciative of the way you made the characters so believable. I can’t wait for the next book in November! I am a huge fan of Rose. I can’t wait for the next box – I read Thirty-Two and a Half Complications within a day! You are a gifted storyteller. Congrats! Happy Anniversary! I can’t imagine my book world without Roses books. I count them among my favorites. I miss mourn the loss everytime I finish a book because I want to dig right Into the next. Thank you for all the hours of joy! You truly are amazing Denise. They are awesome statistics. Congratulations on your three year anniversary and thank you, thank you, thank you for Rose. I adore her. Happy Book Birthday! You are an amazing and gifted writer. I’m a huge Rose fan and now Curse Keepers! This is amazing. I’m just about to self-publish my first book and this gives me so much hope. Thank you and congratulations on your success! I, like so many others it sounds like, stumbled upon Twenty-Eight and a Half Wishes while looking through free books through iTunes. Once I read the book, I knew I HAD to continue! I’ve sped through all of the other Rose Gardner books in one month. While my boyfriend didn’t necessarily enjoy my constant reading, I absolutely did. Congrats on the anniversary and such success! I hope you get plenty more in the future! I’ll be checking into your Facebook page everyday now too. Thanks for the series. Dear Denise, Love your web site and brilliant marketing. I met you at Bea and you gave me the name of your cover designer. Would you be so kind to give me her contact information. Thank you so much. Going to kindle now and need a new cover.